TXT is the simplest format for storing text information. It allows storing text data in lines, without any formatting. Compared with other file formats it provides the smallest file size. That is why it is widely used for storing big amount of text information, creating backup data copies and other needs, where memory space is an issue. TXT file in technical sense is bit sequence, where each text character is represented in binary code. For indicating the end of each line a special delimiter is used. You will not see these delimiters, when reading the text in TXT viewer. They just serve as markers for breaking text into lines properly. ASCII character tables are the most widely used for representing texts of specific languages. The problem is that they are not universal due to the limited character set. If you open TXT file and see some unreadable set of symbols, this means that your program doesn't support requires character set. Unicode solves this problem. It is a huge set of characters that contain subsets for all major languages of the world. Unicode text will be read in any program that works with texts. TXT file is very compact in size. It requires minimum of memory space. It is perfect for cases, when no text formatting is required. As it is unable to store images, tables and other advanced data elements, it is rarely used for documents. Most users prefer TXT for storing logs, service reports, backup data copies, etc. Converting your document history to TXT will save much memory space. 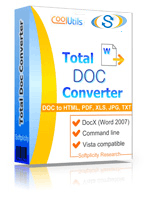 If you need to extract information from TXT and format it in a specific way, it is reasonable to convert it to DOC, RTF, ODT or other formats using Total Doc Converter.